This has carried over into my spiritual life, to some extent, until I found myself questioning the very inner workings of God. I realized, with a revelation from God, that understanding how God works is something I could search out for the rest of my days and just scratch the surface. I don’t need to understand how a toaster works in great detail just to make toast. 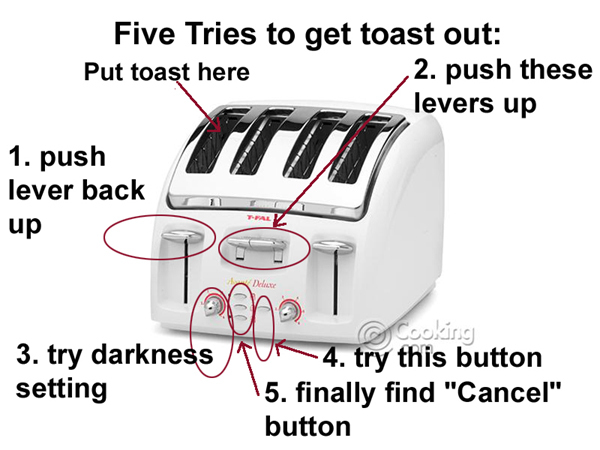 All I need to know is that I put the bread in, push the lever down, and wait till my toast is done. Someone else has done all the hard work for me, the inventor of the toaster. All God requires of you is simply to believe on him like the scripture says. God has called us to walk by faith and not sight. However in our society today we often find ourself defending our belief in God. People everywhere are challenging the very existence of God and then there are people who challenge Gods literal working in our day and time. Ultimately we find ourself defending our very core belief in God and we feel forced to tear open God and REALLY understand him before we can trust him. My mind is taken back to a time when Jesus walked the earth and did many miracles for people. One day there was a lady in Luke 8:43-48 that had a very bad disease, had been to all the doctors around, and was not any better. She had spent all she had to try and get well, but nothing helped. She realized her only hope was this man everyone was talking about. She had heard that he could heal the sick and she was determined to meet him. Her faith went even further than just meeting him, she made up her mind that if she could just touch his robe she knew by faith she would be healed. Her faith was a simple faith. Today people want to research everything under the sun and reason within themselves about God. In essence we want to take God apart and see if we can figure him out. We feel that if we could just fully understand him our faith would somehow magically be greater. Some search and seek yet still never have all the answers to their situation, when all along the answer was right before there very eyes. Jesus is the answer. He is the answer to all life’s questions. You may want a detailed answer and be able to understand it all word for word but all God is requiring is simple faith. The woman simply believed and made her way to Jesus. Nothing more, nothing less. She received a greater miracle than most people in our day and time have ever received and all she knew was that she had heard of a man named Jesus and he could heal people. Nothing more, nothing Less. Make your way to God today with simple faith, believing He is able to meet your every need. Have simple faith and make your way to him and he can provide all the answers. God doesn’t require you to be a Bible scholar, a preacher, or anything more than what you are today. He just wants you to simply believe and come to him. Yes, you can link to my blog. Thank you and God Bless!